Enterprises continue to move applications to the cloud. Knowledge workers now regularly use Software as-a-Service (SaaS) applications such as Office365, Salesforce and Workday, access email from cloud-hosted services, store documents and backups on Box, Dropbox or the like. ERP and CRM systems are primarily cloud-hosted today. Enterprises increasingly choose Infrastructure as-a-Service (IaaS) solutions for lower costs while increasing IT agility. In fact, IDC estimates that 78% of all workloads will be processed in public or private cloud data centers by 2018*. However, workers in branch offices commonly complain that cloud-hosted applications perform better from home than from the branch. Why? Because from home, SaaS application and IaaS access is directly over the internet at speeds of up to 100Mbps or even higher. With the traditional router-centric branch WAN edge model, access is not direct to the internet. All internet-bound traffic is backhauled to a headquarters or hub site where additional security screening is performed to protect the enterprise from vulnerabilities. Basic SD-WAN solutions also employ an “all-or-nothing” approach to handling internet-bound traffic or must rely on a manual process for configuring Access Control Lists (ACL) on every appliance to identify specific IP addresses to steer trusted SaaS applications directly to the internet. Not only is traffic backhaul inefficient – potentially requiring additional and costly bandwidth – it also adds latency which negatively impacts cloud application performance resulting in decreased worker productivity and satisfaction. Additionally, SaaS address ACLs become obsolete within days requiring another round of manual programming. Figure 1: Granular traffic steering requires application classification on the first packet. Direct access to cloud applications from the branch over the internet delivers the highest performance. But not all applications are equal, and some web traffic can expose the enterprise to viruses, trojans, DDoS attacks and other vulnerabilities. Therefore, direct cloud breakout must also be secure. Implementing a granular security policy for web applications requires granular traffic steering since many HTTP and HTTPS applications share the same TCP ports. However, the steering decision must be made on the first packet of the application. Once an application session – or flow – has been established, it cannot be moved to an alternate path. Figure 2: First-packet iQ employs multiple techniques to classify more than 10,000 SaaS and web applications and 300 million web domains. Traditional application classification techniques utilize a combination of well-known IP addresses, TCP/UDP port numbers and Deep Packet Inspection (DPI). DPI is useful when applications use ports unpredictably, or when you must distinguish applications that share the same HTTP or HTTPS port. However, DPI is not sufficient to granulary steer traffic to a specific destination based on the application because it cannot identify the application on the first packet. DPI relies on a library of application signatures and heuristics, requiring two to six packets to identify an HTTP application and 10 packets or more to identify an HTTPS application. While this is acceptable for flow reporting, QoS marking and even blocking a connection, it is unable to support granular traffic steering required to implement finegrained security policies across the WAN. First-packet iQ identifies more than 10,000 applications and more than 300 million web domains on the first packet. First-packet iQ goes beyond typical DPI and port-level approaches used today and adds Cloud Intelligence to maintain an up-to-date data-base of IP addresses used by SaaS applications. First-packet iQ employs multiple techniques as shown in Figure 2 to classify applications providing unprecedented application visibility and a superior identification confidence level. Imagine several trains that consist of an engine and multiple boxcars traveling from San Francisco. Trains carrying furniture need to be directed east to Denver, and trains carrying aerospace components need to be directed south to Los Angeles. However, you are not able to determine the cargo that the train is carrying until the engine and three to five boxcars have passed the railroad switch. The engine represents the first packet of a TCP/IP flow and the boxcars represent subsequent packets of the flow. As the train approaches the switch to connect to the different tracks serving Denver and Los Angeles, the switch operator can’t wait until the fifth, third or even the second boxcar has passed. To avoid a disastrous outcome, the routing decision for the train must be made before the engine reaches the switch. Therefore, a technique is required to identify the boxcar contents before the engine passes the switch. To steer traffic to its correct path in order to enforce security policies, traffic must be classified on the very first packet of a flow. 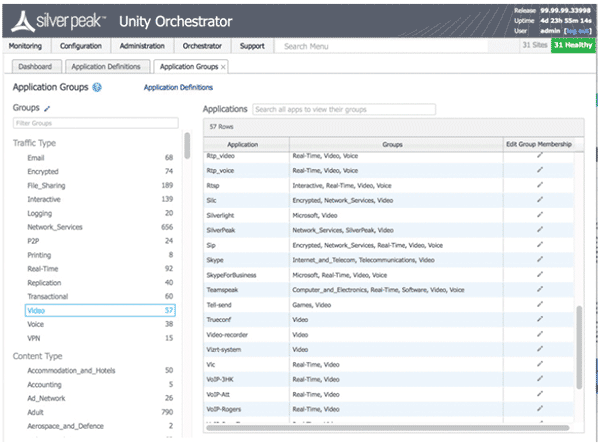 Silver Peak Unity EdgeConnect unprecedented application visibility and a superior identification confidence level. Popular, highly-subscribed SaaS applications such as Office365, Salesforce, Workday, Box, Dropbox, and others employ hundreds or even thousands of IP addresses to support their huge number of users. These IP addresses are not static; they may be re-allocated to a different region or to a different application. New addresses are added frequently to keep up with end user demand. In short, the pool of IP addresses used by SaaS applications changes almost continuously. Table 1 is a short excerpt from a daily SaaS application subnet change report showing addresses deleted and those added to the IP address pool for Skype for Business and Office365. Some SD-WAN solutions claim to steer applications on the first packet, and they can accomplish this using ACLs. However, ACLs are static and must be manually programmed. A security policy may work properly when initially configured but fail days or weeks later after SaaS application IP addresses change. Manual re-programming of IP addresses into ACLs simply cannot stay current with the dynamic nature of SaaS applications. 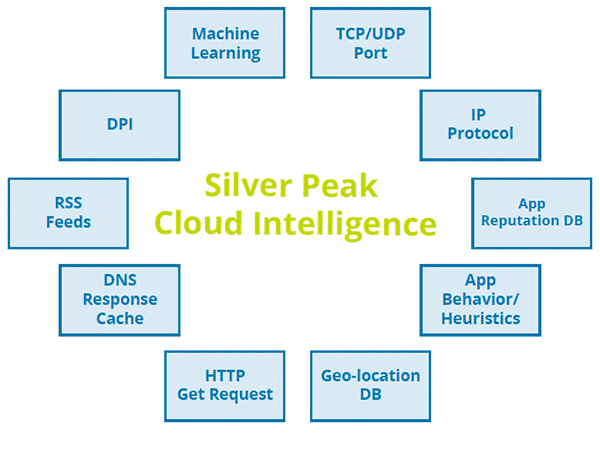 Silver Peak Cloud Intelligence maintains a centralized application database or “map of the internet” that is continuously updated based on the application classification techniques described previously. On a daily basis, EdgeConnect SD-WAN appliances receive an update to their resident application address database to remain current with changing SaaS and web IP addresses, as shown in Figure 3. This update process is similar to that employed by a computer virus protection application. Table 1: Daily IP address changes such as those seen here for Office365 and Skype-for-Business require an internet map that is continuously updated. An integrated zone-based stateful firewall is essential for a complete, secure cloud breakout solution enabling direct internet connectivity to trusted SaaS applications and IaaS from branch offices. The EdgeConnect zone-based firewall further hardens the enterprise WAN by blocking unwanted or unauthorized traffic attempting to enter the branch network. The only inbound sessions allowed are responses to communications initiated from within the branch or to ports whitelisted and opened up for trusted inbound communication, for example, to remotely manage a printer or teleconferencing system. A key benefit of a complete SD-WAN solution is simplified, centralized orchestration. Through an intuitive graphical user interface (GUI), Silver Peak Unity Orchestrator streamlines configuration and distribution of security policies to all appliances in the EdgeConnect SD-WAN fabric. This results not only in significant operational cost savings but also reduces the potential for incorrect application handling due to human error. Orchestrator uses industry-standard application groupings by traffic type such as email, voice and video and by content type such as auctions, automotive, aviation, education, fantasy sports, social media and more (Figure 4) to further simplify security policy definition. As described previously, automated daily updates of the application IP address database to EdgeConnect appliances keep pace with SaaS and web address changes. Figure 3: Application IP address database is updated daily to every EdgeConnect appliance. Figure 4: Application grouping simplifies security policy administration. Direct internet breakout from the branch provides the highest SaaS application and IaaS performance. However, for sites not served by internet connections or if corporate security policies require backhaul of SaaS applications for additional security screening, Silver Peak Cloud Intelligence includes information to optimally route traffic for the best performance. The Silver Peak SaaS optimization feature measures the loss, latency and other metrics from EdgeConnect devices to physical egress points where SaaS providers’ data is being served. 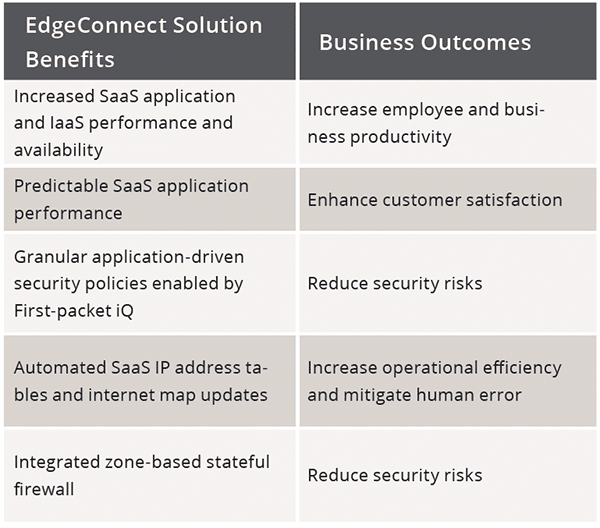 This information is updated continuously to appliances in the EdgeConnect SD-WAN providing the optimal end-to-end path for any user to the SaaS application. Table 2: Silver Peak Unity EdgeConnect SD-WAN solution delivers tangible benefits and business outcomes. As enterprises continue their migration to the cloud, they increasingly adopt a “cloud-first” SD-WAN architecture to provide the highest levels of SaaS application and IaaS performance providing a number of tangible business benefits to the enterprise. The Silver Peak EdgeConnect SD-WAN solution with First-packet iQ and Cloud Intelligence delivers the highest performance for the cloudfirst enterprise while protecting branch offices from unwanted threats and vulnerabilities.